By Dr Amy Jo Dowd, Lauren Pisani, Caroline Dusabe and Holly Jane Howell from Save the Children. This blog was originally posted on the UNICEF website on 14 June 2018. Children spend more time outside school than they do inside it. It is here that parents and caregivers can shape their learning environments and opportunities. Consider a primary school child in Malawi. 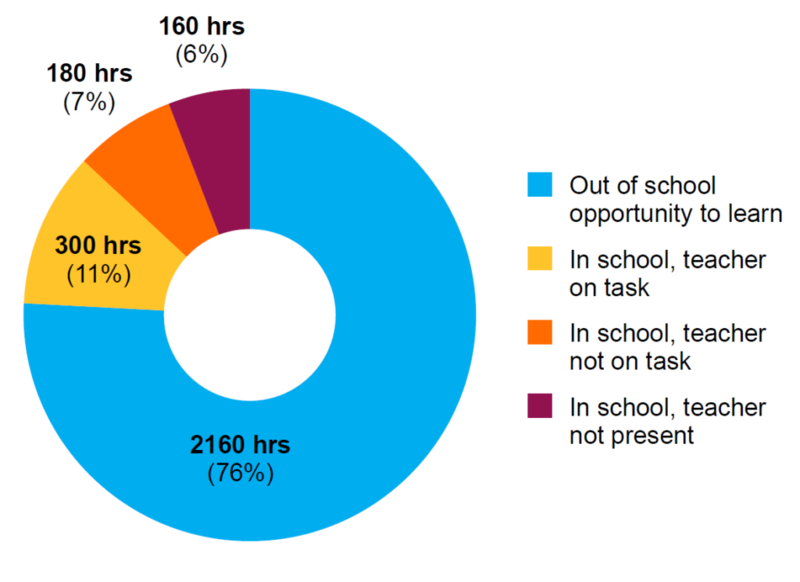 According to the pie chart below, the child’s opportunity to learn in school is effectively two-and-a-half hours of on-task time a day for six months: roughly 300 hours of in-school learning a year. In contrast, the child has over 2,000 hours of opportunity to learn outside of school, that’s 76 per cent of their waking hours. © Save The Children Figure illustrating annual hours of opportunity for a primary school child to learn in Malawi. To fully support children’s learning, we must leverage all available opportunities. This means going beyond the 24 per cent of time children spend in school and looking at time they spend outside. We must pay attention to the role of parents and caregivers during this substantial amount of time, and strategize about how to support them to optimize children’s learning. 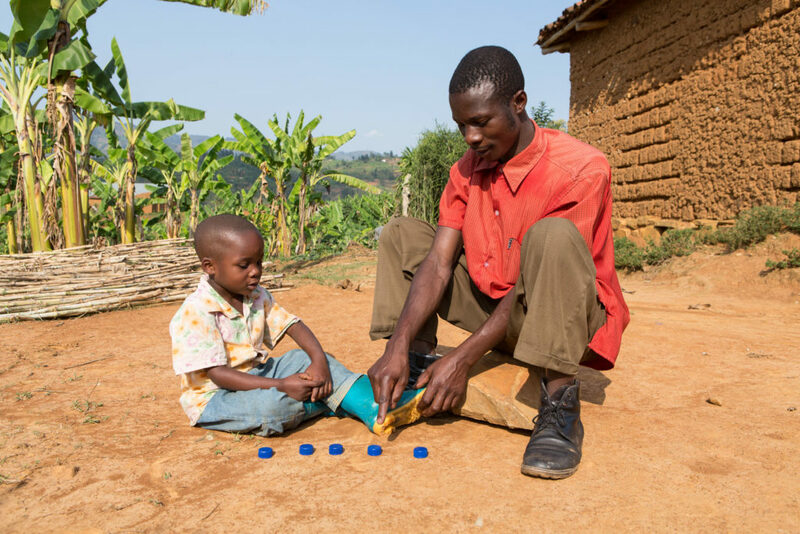 © Save the Children/Rwanda/2018 Jean Dacascene Hakizemana teaches his son Epaphrodite, three, to count to five through an activity using bottle caps in Ngororero District Rwanda. Parents are taught simple learning activities like this one through Save the Children’s First Read project. In Eastern and Southern Africa, many initiatives that address the role of parents and caregivers in children’s learning are emerging. These are working across a child’s education course of early childhood development, primary education and are geared towards developing adolescents and young people’s skills. 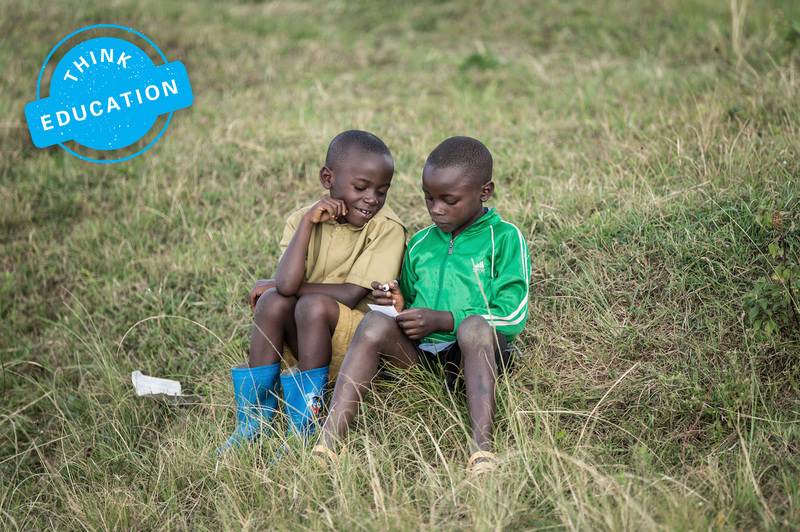 Ethiopia, Malawi and Rwanda —education cards spread messages addressing parental attitudes and early childhood learning. They can be shared through a variety of platforms including community meetings, ECD centres and community health worker visits. Zambia and Rwanda — interactive radio instruction reinforces positive parenting practices. Rwanda and Ethiopia — community members train parents and caregivers on how to engage with their children in learning and play activities during their daily routines. 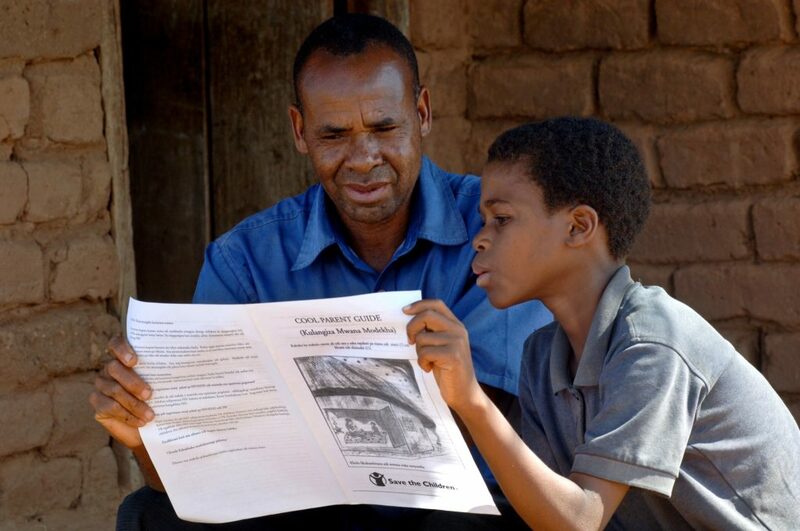 Malawi — interactive radio instruction has been effectively used for students in grades 1 to 4. 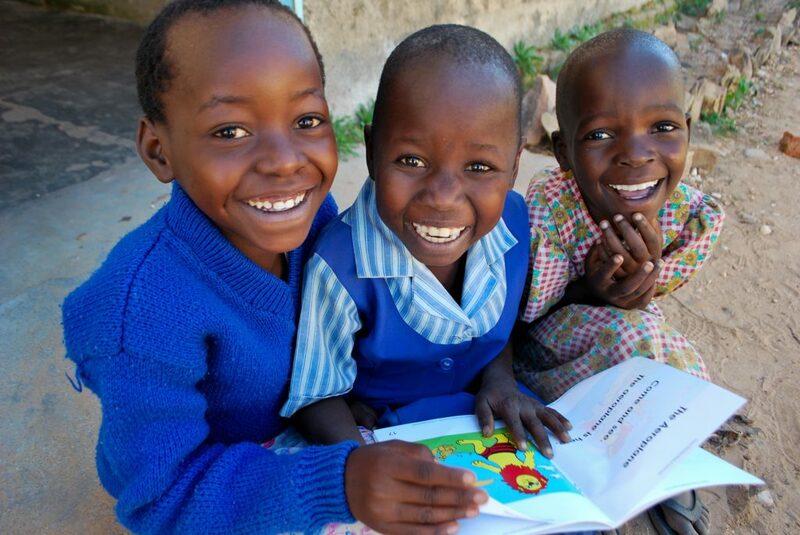 Malawi, Rwanda and Ethiopia — community reading activities like reading in groups and discussing stories, reading in pairs where one reader is more skilled than another, borrowing books, and participating in literacy celebrations have shown gains in reading comprehension. In many countries, the importance of reading outside of school hours has been taken up across national reading programmes; in part seen by the recent shift in USAID-funded reading programmes in Malawi, Ethiopia and Rwanda. Burkina Faso, Egypt, Ethiopia, Malawi and Uganda — evidence from a youth programme for out-of-school boys and girls suggests that more strategic and explicit involvement of the family in development programmes for adolescents can determine not only how well they use the skills they learn but also the longer-term sustainability of the livelihoods they eventually select. Strengthening parental support for learning by reducing barriers to formal schooling like child labour and early marriage, especially for girls whose education is not always prioritized. Engaging parents, caregivers and communities to support youth’s social and emotional competencies alongside their livelihoods. Connecting to employment opportunities and networks of local skilled tradespeople and with opportunities to establish a reputation for being hard-working and responsible. © Save the Children/Zimbabwe/2018/Burke Tatenda Musanura, (8), Chipo Tenzi, (9), and Trish Mapingue, (8), share a story book during class at Matau Primary School in Zimbabwe on May 4, 2011. How can education ministries support learning throughout a child’s life? Government investments must include action points that assist parents and caregivers in supporting children’s learning outside of institutions. For example, in Rwanda the new Education Sector Strategic Plan 3 includes a goal on parenting education and sensitization. The Rwanda ECD policy also strategically focuses on parenting education and is committed to rolling out a national parenting programme. In addition, the draft Literacy Policy emphasizes the use of children’s out-of-school time for activities such as participation in reading clubs. Modules on roles of parents and parenting education have been incorporated into pre-service and in-service teacher training. Modules for Parent Teacher Associations to train parents on how to support children’s learning have been developed; and for coordination, local leaders are expected to include sensitization of parents and parenting education in district plans as well as in their own performance contracts. © Save the Children/Malawi/2018/Bisceglie Bonamali Lyson talking with his son, Hawa Bonomali, (9), at home. They are discussing the Save the Children Cool Parent guide. They live in Mkuchila village, Malawi. Countries can follow Rwanda’s blueprint by including parenting in different strategic documents and plans both at policy level and for implementation. This will leverage the power of an additional 76 per cent of opportunity to learn in a child’s life. Dr. Amy Jo Dowd, Lauren Pisani, Caroline Dusabe and Holly Jane Howell work with Save the Children as technical advisers on research and programming across the globe. Since 2009, they have been engaged in efforts to enhance parents’ and caregivers’ support for learning and to document the impact and equity of these efforts.